I’m not going to describe World of Warcraft in full since you can get that sort of information elsewhere. Instead, I’m going to talk about my first impressions of this Stress Test Beta. Keep in mind the version tested is simply a beta, so quite a few things may change in the final version. Needless to mention that I played the game on a Volari Duo card (hence the user name, lol)- the game was smooth all along in High Detail mode, even in outdoor scenes. The download was a huge one. The zipped installer weighed nothing less than 2,5 Go. Once installed, this beta weighs over 2,95 Go on the hard disk. Surprisingly though, the loading times for the game were extremely short, barely a few seconds. There are eight playable races in World of Warcraft : four (humans, dwarves, night elves, and gnomes) belong to the human alliance and four (orcs, taurens, trolls, and the undead) belong to the horde. 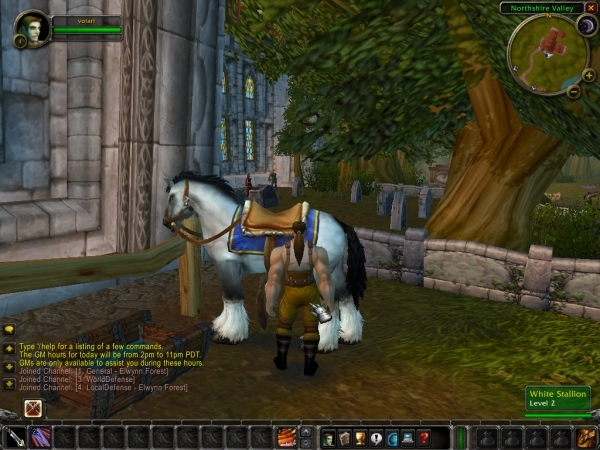 The game also features nine different classes, including paladins, rogues, priests, hunters, warlocks, druids and warriors. An interesting point is that certain characters are reserved for certain races. Also, depending on which race you choose, you will begin the game in different parts of the world. As you start up the game and start killing some wild animals (wolves, boards, rabbits, etc. ), you rapidly gain experience points. 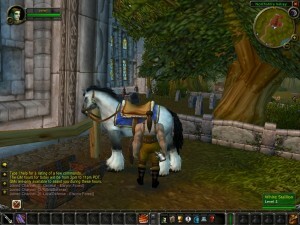 Graphically, World of Warcraft looks very good, as you can see from the screenshots. The game features a lot of eye candy and great visual effects. The sky dynamically changes and each zone seems to have different weather patterns. The character models are rather detailed and the ourdoor areas are very large. The environments are very rich and colorful, and each zone looks completely different from the other. I also appreciate the “cartoonish” style of the game. When you die, you become a ghost and appear to a Spirit Healer. This Healer gives you the choice to remain as a ghost (and roam around haunting people) or the Healer can revive you so that you can have a body again. However, choosing the revival means you loose some hard earned experience points, but the Healer said that if you manage to find your original dead body (at the place where you died), then you will not loose any experience points. The game is very easy to get started with and the game interface is also very simple to use. In fact, almost all the interaction with the world will be handled through the mouse, with a cursor change to show what action is possible. Opening a door, attacking, or trading are all accomplished with the mouse, so there is no combinaison of keys to learn by heart in order to play. I did come across an “issue” in this beta though. I was indeed able to go through through every characters and animals, even though they were not ghosts. Anyway, I did not find this annoying and will certainly be adressed in the near future. All in all, I certainly had a positive impression after this Stress Test Beta session.